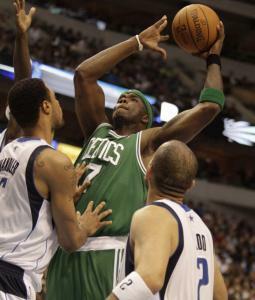 DALLAS — In a moment of failure, Rajon Rondo took a major step forward as a leader and a franchise point guard. The scouting report on Rondo is brutally honest. Leave him alone on the perimeter. If he hits three in a row, leave him alone. If he hits five, leave him alone. DALLAS — One play was a breakdown by a team built on defense. The other was simply a tough shot by a player paid $20 million a year to take tough shots. The first play, though, was the backbreaker. Jason Kidd weaved into the lane, his Mavericks down 3 points to the Celtics after wasting a 14-point lead, when he noticed Jason Terry and his perpetually hot hand wide open on the wing.